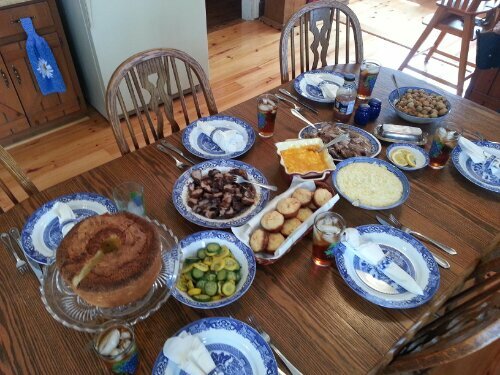 Our Easter Sunday dinner spread of pork tenderloin, mayonnaise biscuits, cream corn, fried okra, sautéed zucchini and squash, macaroni and cheese and pound cake with sweet iced tea. We all know the saying, “If these walls could talk,” but if my family’s kitchen table could speak–boy, could it tell some stories. I’m fortunate enough to have been raised eating around the family table, and every day I’m thankful my parents made it a priority. 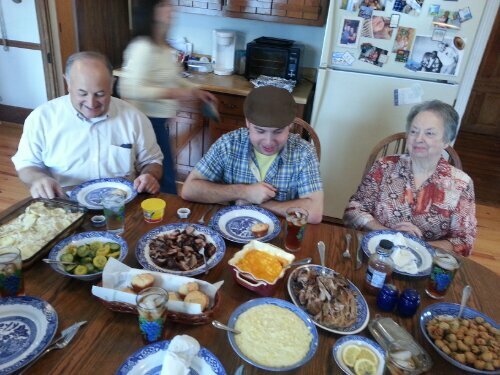 From left: Daddy, cousin Justin and Grandma Dot. Mama, the ultimate hostess, scurries in the background ensuring everyone is taken care of. In homes across the world, the kitchen table, much like the front porch, is an iconic, central hub, especially in the American South. Formal dining rooms are different. I’m talking about the table in our eat-in kitchens–the one we cook just steps away from, where we stack our bills at the end of the day, where kids complete their homework, where the family pet begs for that taste of human food. Family gathers in the kitchen to celebrate my Grandma’s 75th birthday. When I think about the people in my family who’ve sat around that same oak, oval-shaped table year after year–even the loved ones who are no longer with us–and all the abundant food that’s been presented on the table top, when I consider the memories it holds, the conversations it keeps and the prayers its heard, I feel ultimately blessed to have experienced that togetherness and I recognize those are the moments that make a house a home. 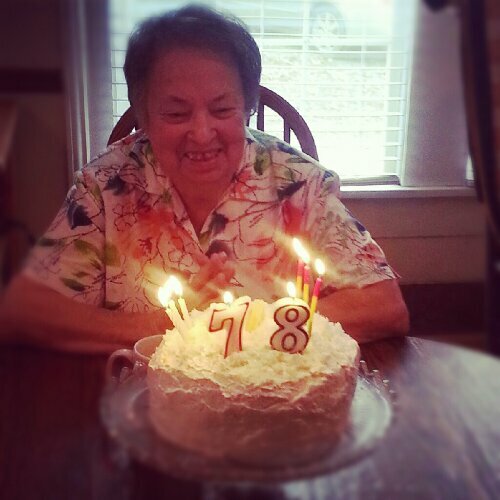 Grandma Dot makes a wish on her 78th Birthday. 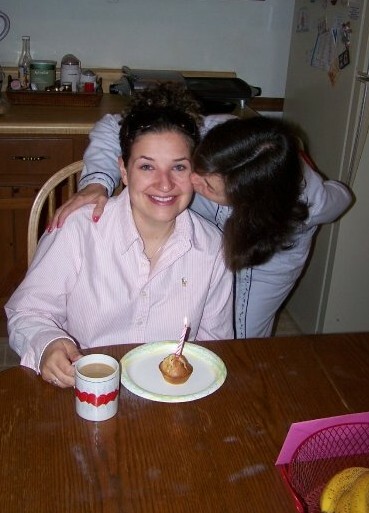 Enjoying my 26th birthday with my traditional chocolate chip muffin at the kitchen table on April 6, 2009. It’s around the kitchen table that we’ve celebrated birthday after birthday, eaten holiday meals, opened Mother’s Day cards and decorated Christmas cookies. It’s there every time I visit home. Like an old friend, it’s the one constant that’s part of the family too, ready to welcome us, inviting us to sit for a spell and stay a while. There, I eat my mom’s homemade chocolate chip muffin with one candle for breakfast each year, there I introduce new friends to the family. It’s the ultimate place boyfriends are bring-home-to-mama-and-daddy tested. We set it with our everyday dishes and fine china. We adorn it with fresh flowers and fruit in its center. There, we hold hands around it and bow our heads to pray. Without it, home would not be the same. 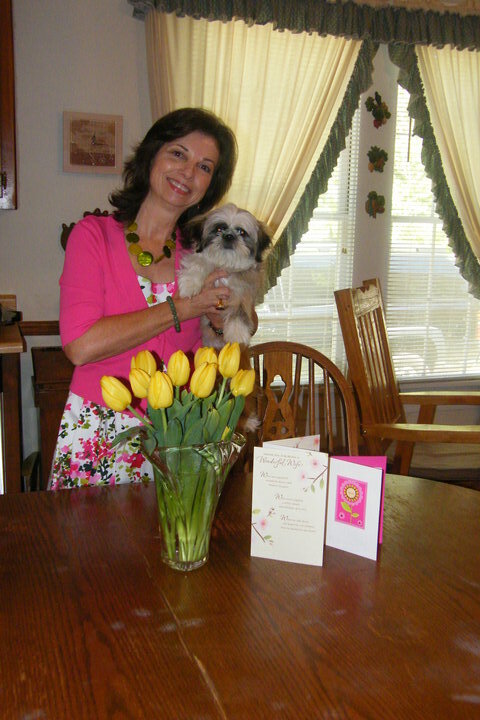 My mama, Debbie, with Ewok and her Mother’s Day tulips. 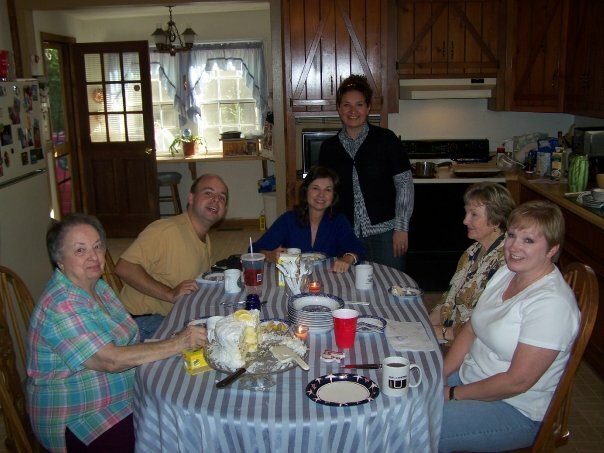 Sure, I’m one to curl up on the couch with a bowl of cereal now and then in front of my TV, but nothing beats sitting down to a home-cooked meal and a place set just for you, to share good food with the people you know and who know you and where you came from. 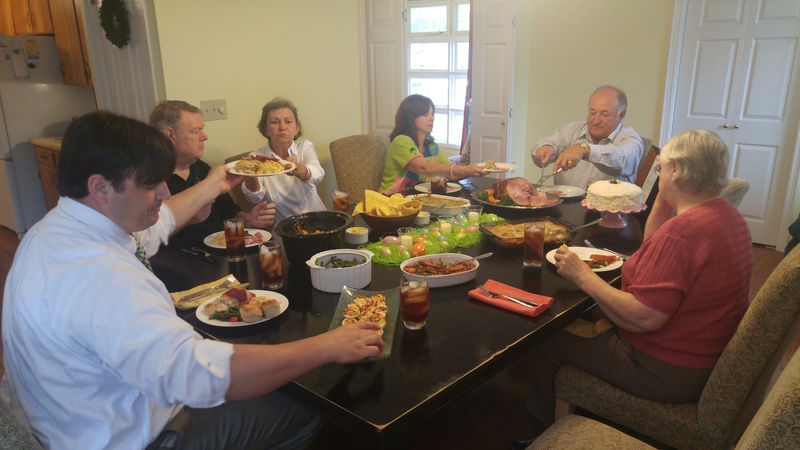 So much of my life has taken place at the family table and often, it’s the memories associated with that central element that have created the values and traditions I cherish today. So here’s to you table….and thanks. What’s your take on the family table? Can you relate?